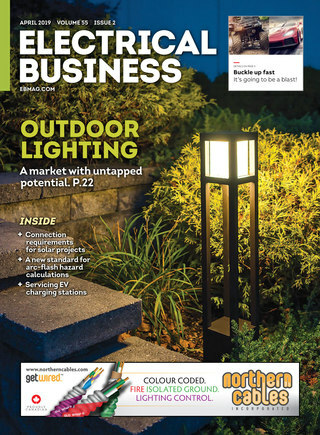 Electrical Business Magazine and its affiliated brands offer you the greatest reach into Canada’s electrical contracting and maintenance markets, PLUS electrical engineers and distributors, energy managers, related stakeholders and more. 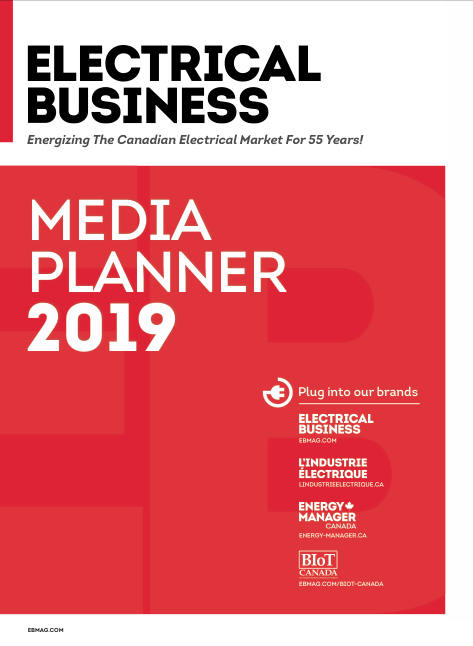 Entering its 55th year of publication, EBMag is the only third-party audited electrical magazine in the Canadian market, and on the leading edge of CASL-compliant (anti-spam) digital offerings. 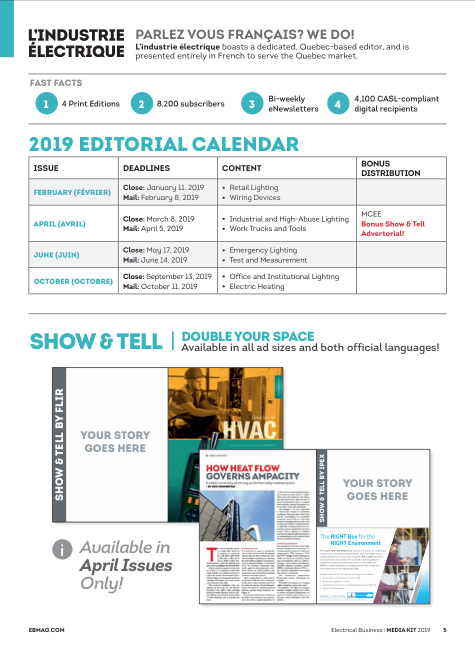 EBMag is the go-to resource for Canada’s electrical contracting, maintenance and engineering professionals, and associated disciplines, serving over 20,000 readers and 14,000+ email subscribers. 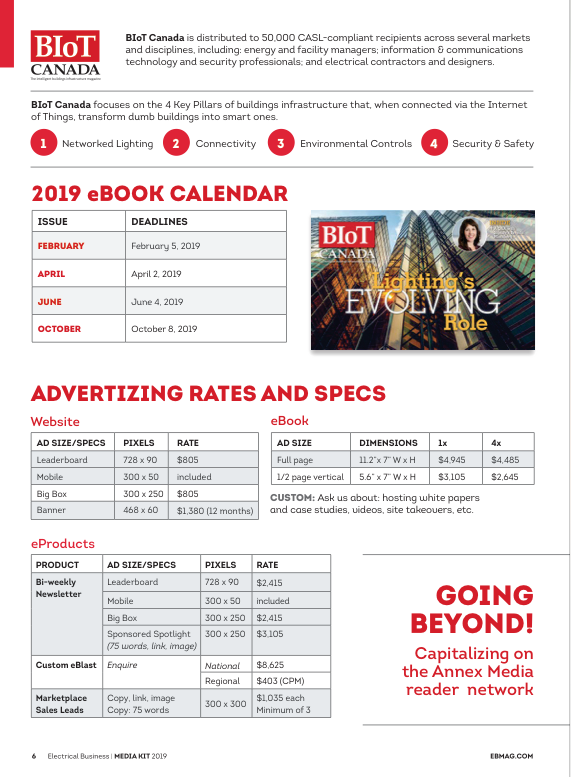 BIoT Canada is an exciting new eBook that focuses on the solutions that transform dumb Buildings into smart ones via the interconnectedness of devices, systems and technologies across the Internet of Things. BIoT Canada is distributed to over 50,000+ CASL-compliant readers across several markets and disciplines, including: energy and facility managers; information communications technology and security professionals; and electrical contractors and designers. L’industrie électrique boasts a dedicated, Quebec-based editor, and is presented entirely in French to serve Quebec’s electrical contracting, maintenance and engineering professionals, and associated disciplines. It serves 8500 readers and 4100 email subscribers. Energy Manager Canada reaches 15,700 CASL-compliant subscribers who are property, building, facility, operations and energy managers across industrial, commercial and institutional sectors. New for 2019! 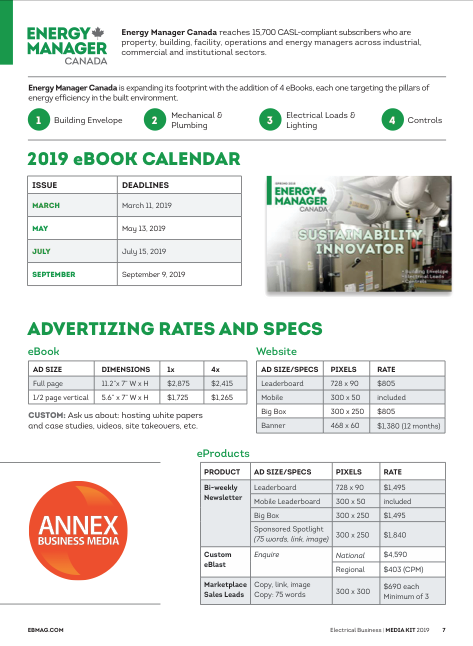 EMC is expanding its footprint with the addition of 4 eBooks, each one covering the pillars of energy efficiency in the built environment: Building Envelope, Mechanical & Plumbing, Electrical, and Controls.